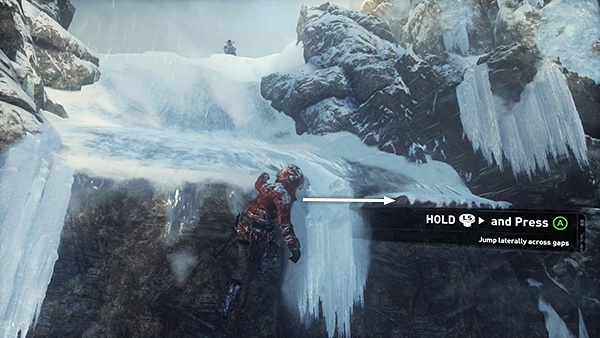 ...to dig in with your climbing axe and prevent Lara from falling to her death. 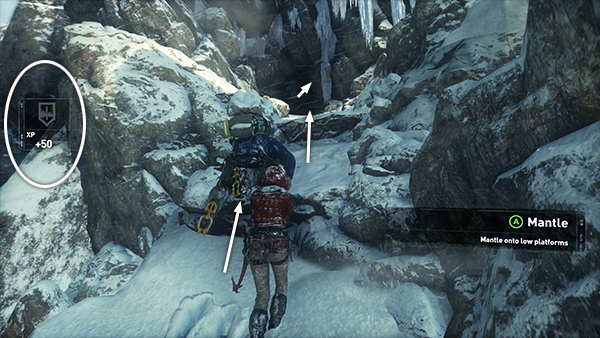 Once Lara is hanging from the ledge, push the left stick to the right and then press Jump (A on Xbox controller/Space on keyboard) to clear the gap in the ledge and grab onto the other side. Climb to the right a little more then press Jump (A/Space) three times to climb to the upper ledge. Turn right and approach the ice wall. The game gives a brief tutorial about climbable walls. 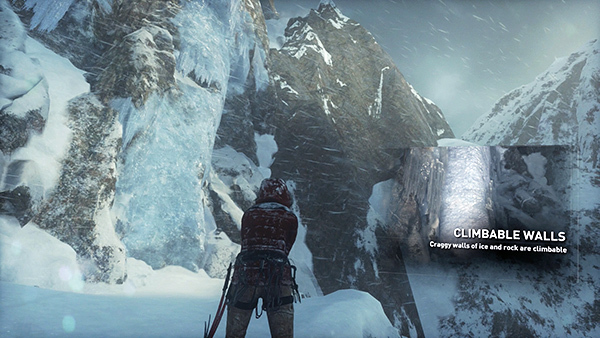 Any time you activate Survival Instinct (by pressing in on the right stick or Q on the keyboard), you'll see climbable surfaces highlighted in yellow. 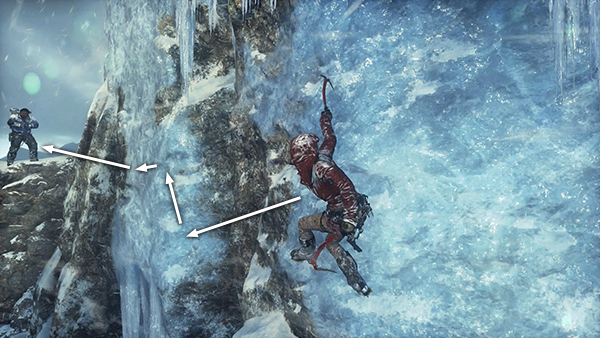 Jump toward the wall and press Interact (X/E) to latch on with both climbing axes. Now use the left stick to climb up the wall, around to the right, upward a little more, then to the left as far as you can go. 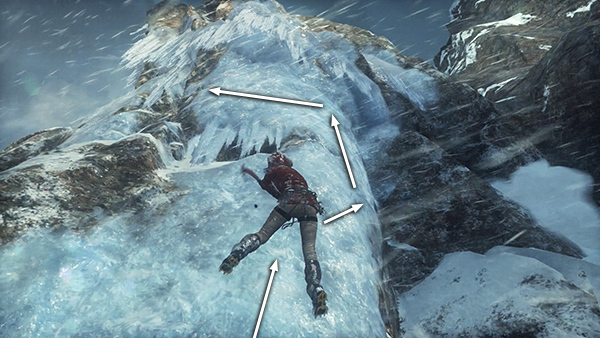 Push the left stick to the left so Lara leans out toward the rocky gap between the ice walls. 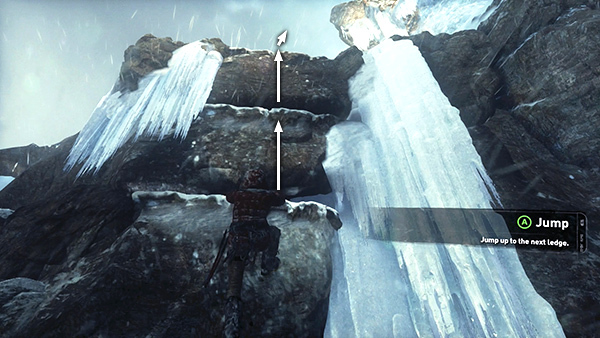 Then press Jump (A/Space) to leap across the gap and Interact (X/E) again to latch onto the ice once more. Climb upward and to the left again. 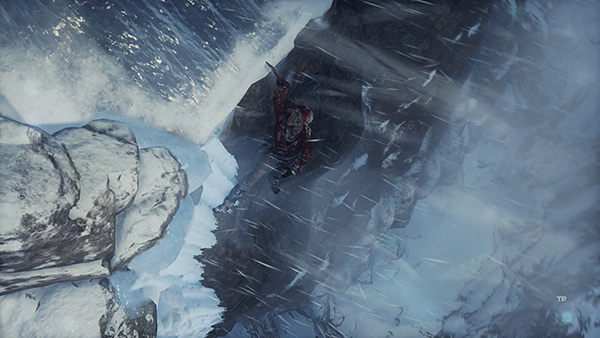 Finally, jump toward Jonah to trigger a brief cutscene in which he pulls Lara up onto the ledge. 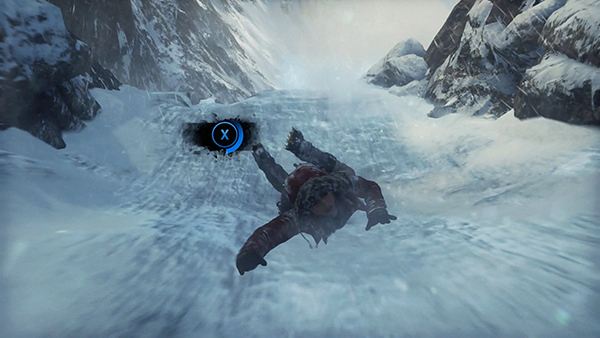 At this point you are rewarded with 50 experience points (XP) for surviving the mishap. See the notes on XP in the main walkthrough. Continue up the path, pressing forward and Jump to vault up each of the low ledges. 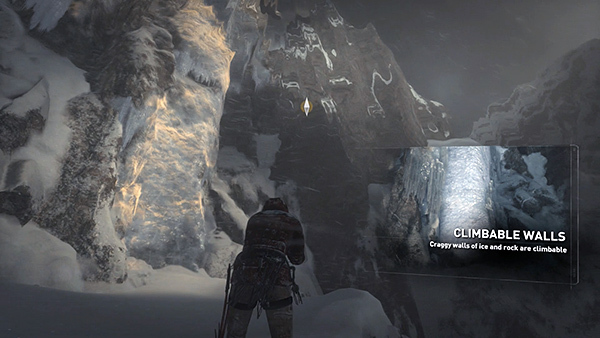 When you enter the cave ahead, Lara automatically lights a flare. Make your way through the dark tunnel. On the other side, follow the path up and around to the left.